The history of the International Taekwon-Do Federation, ITF, cannot be told without telling the personal history of the acknowledged father of modern Taekwon-Do, founder and president of the ITF, General Choi Hong Hi. It is because of his tireless effort and unflagging dedication that Taekwon-Do has the international status that it know receives. General Choi Hong Hi was born on November 9th, 1918 in the rugged and harsh area of HwaDae, Myong Chun District in what is now D.P.R. of Korea. In his youth he was frail and quite sickly, a constant source of worry for his parents. Even at an early age, however, the future general showed a strong and independent spirit. At the age of twelve, he was expelled from school for agitating the Japanese authorities who were in control of Korea, from 1910 to 1945. This was the beginning of what would be a long association with the Kwang Ju Student's Independence Movement. After his expulsion, young Choi's father sent him to study calligraphy under one of the most famous teachers in Korea, Mr. Han Il Dong. Han, in addition to his skills as a calligrapher, was also a master of Taek Kyon, the ancient Korean art of foot fighting. The teacher, concerned over the frail condition of his new student, began teaching him the rigorous exercises of Taek Kyon to help build his body. In 1937, Choi was sent to Kyoto, Japan to further his education. In Kyoto, Choi met a fellow Korean, Mr. Kim, who was engaged in teaching the Japanese martial art, Karate. 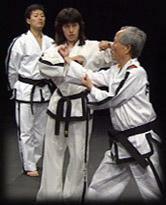 With two years of concentrated training, Choi attained the rank of first degree black belt. These techniques together with Taek Kyon, foot techniques, were the forerunners of modern Taekwon-Do. With the outbreak of World War II, Choi was forced to enlist in the Japanese army through no volition of his own. While at his post in Pyongyang, North Korea, Choi was implicated as the planner of the Korean Independence Movement, known as the Pyongyang Student Soldiers' Movement and was interned at a Japanese prison during his eight month pretrial examination. While in prison, Choi began practicing his art in the solitude of his cell. In a short time, his cellmate and jailer became his students. Eventually, the whole prison courtyard became one gigantic gymnasium. The liberation in August 1945 spared Choi from an imposed seven year prison sentence. Following his release, the ex-prisoner traveled to Seoul where he organized a student soldier's party. In January of the following year, Choi was commissioned as a second lieutenant in the new South Korean army, the "Launching Pad" for putting Taekwon-Do in a new orbit. Choi was soon company commander in Kwang-Ju, where the young second lieutenant lit the torch of this art by teaching his entire company. Promoted to first lieutenant, Choi was transferred to Tae Jon and put in command of the Second Infantry Regiment. While at his new post, Choi began spreading the art not only to Korean soldiers, but also to the Americans stationed there.This was the first introduction to Americans of what would eventually become known as Taekwon-Do. In 1947, Choi was first promoted to captain and then major. In late 1948, he became a lieutenant colonel. In 1949, Choi was promoted to full colonel and visited the United States for the first time, attending the Fort Riley Ground General School. In 1951, Choi was promoted to brigadier general. 1953 brought the organization of the crack 29th Infantry Division at Cheju Island, which eventually became the spearhead of Taekwon-Do in the military and established the Oh Do Kwan (Gym of My Way), where he succeeded not only in training the cadre instructors for the entire military, but also developing the Taek Kyon and Karate techniques into a modern system of Taekwon-Do, with the help of Mr. Nam Tae Hi, his right hand man in 1954. Technically, 1955 signaled the beginning of Taekwon-Do as a formally recognized art in Korea. During that year, a special board was formed which included leading master instructors, historians, and prominent leaders of the society. A number of names for the new martial art were submitted. On the 11th of April, the board summoned by General Choi, decided on the unified name of Taekwon-Do which had been submitted by him. This single unified name of Taekwon-Do replaced the different and confusing terms, such as Dang Soo, Gong Soo, Taek Kyon, and Kwon Bup. In 1959, Taekwon-Do spread beyond its national boundaries. The father of Taekwon-Do and nineteen of his top black belt holders toured the Far East. The tour was a major success, astounding all spectators with the excellence of the Taekwon-Do techniques. Also in 1959, Choi was elevated to two illustrious posts; President of the newly-formed Korea Taekwon-Do Association, and the deputy commander of the 2nd Army in Tae Gu. In the year 1960, the General visited Jhoon Rhee's Karate Club in San Antonio, where he convinced the students to use the name Taekwon-Do instead of Karate. Thus John Rhea is known as the first Taekwon-Do instructor in America. This marked the beginning of Taekwon-Do in the United States of America. The 1960's brought the rapid spread of Taekwon-Do not only to the Korean populous and military, but to the United States, and many other countries throughout the world, with General Choi as the ambassador. This was the basis not only for establishing Taekwon-Do associations in a great number of countries, but also the formation of the International Taekwon-Do Federation as it is known today. In 1966, the dream of the sickly young student of calligraphy, who rose to Ambassador and the Association President of the most respected martial art in the world, came true. On the 22nd of March, the International Taekwon-Do Federation was formed with associations in Vietnam, Malaysia, Singapore, West Germany, the United States, Turkey, Italy, Arab Republic of Egypt and Korea. The next several years saw the exponential growth of ITF Taekwon-Do, with General Choi tirelessly traveling the world to teach and expand his art. During these travels, the General Choi has been especially interested in promoting Taekwon-Do among the youth of the world. The President of the International Taekwon-Do Federation has been instrumental in introducing the art to numerous universities in Europe, America, the Middle East and the Far East. In 1972, General Choi moved the headquarters of the International Taekwon-Do Federation, with the unanimous consent of member countries, to Toronto, Canada, envisaging to spread this art eventually to all countries throughout the world. In 1985, the founder of Taekwon-Do strengthened his desire to spread his art to the entire world, especially third world and politically disadvantaged countries by moving the International Taekwon-Do Federation to Vienna, the capital city of Austria, where it is still located. Throughout his life, General Choi's greatest desire was to spread Taekwon-Do, his art, to all people, no matter race, creed or political view. With the foundation of the ITF, General Choi's vision of establishing Taekwon-Do as a worldwide non-political organization and martial art, not just a sport, has come true. General Choi states in his book, "Taekwon-Do:"
"All things are governed by the law of Yin and Yang, dark and light... happiness can often stem from catastrophic moments... My life has been a turbulent one, riddled with lonely fights and unfortunate adventure that few would envy... a life of self-exile thousands of miles distant from my beloved country. Even so it has truly been a worthwhile endeavor. It is one of nature's ironies that delicate plants such as orchids or tulips require extreme care while weeds flourish with no attention at all. Wild panic grass, easily mistaken for wheat or rice, can actually prevent the growth of the genuine article. I cannot help but despair over the tainted image of Taekwon-Do recently created by practitioners of sham Taekwon-Do, who have nothing in common with the origin and art form except for a borrowed name. I console myself with this thought: Like a counterfeit diamond that cannot cut glass, fraudulent Taekwon-Do is appearance without substance and like a summer shower that quickly dries from the earth or a hurricane that rapidly passes from the sky, phony Taekwon-Do practitioners and imitators cannot endure. It exists solely on the strength of political influence and is totally devoid of fundamental philosophy or technique based on logic. As such it is destined for an early exit. The issue lies in our ability to differentiate between the true and the false. My dream has at last been realized... the ultimate fantasy of spreading and teaching Taekwon-Do with no regard to considerations of religion, ideology, national boundaries, or race. I can say without hesitation that I am the happiest man alive. It is my earnest desire that Taekwon-Do should retain its original concept and technique. It is also my sincere hope that Taekwon-Do's emphasis on promoting a healthier body and mind will provide a significant contribution to human progress for many generations to come."